A recent report titled ‘The Rising Sun’, published by KPMG, indicates that the solar power in India is anticipated to fulfill around 5% to 7% of its power needs by 2021-2022 and will enable the country to cut down its coal imports by more than 30%. However, the government regulatory structure in the country is yet to acquire a solid shape. The report indicates that governments and utility companies are finding it a challenge to buy expensive solar power at nearly Rs.12 a unit when the normal power is available for Rs.3 or Rs.4. The report indicates that clean energy producers were earlier encouraged by the 15% clean energy mix spelled out by the National Action Plan on Climate Change (NAPCC), but the ministry had subsequently brought it down to 6% and the current production hovers around 3.5% to 4%. This has created mixed opinions and confusion among solar stake holders. The new proposed plan has set an overall target of achieving 21,700 MW in the ensuing six years, thus making the total share of renewables to 41,400 MW. The government estimates that the solar power generation will ultimately go up in India due to the anticipated reduction in power production costs. The government expects that solar power will come down to Rs.11.80 per unit in 2013-2014 and ultimately reach a level of Rs.9 per unit in 2016-2017. The report estimates that the solar power production will cut down carbon dioxide emissions in India by 2.5%, which is only a tenth of the 20%-25% reduction the country has agreed at the international summit on climate change held at Copenhagen. The report indicates that solar power producers in India are concerned about the slow implementation of a scheme that makes it compulsory for utility firms to buy certain amount of renewable power. NEW DELHI — India has made it into the A-list of global investors in renewable energy, a recognition of the country’s proactive government energy program, natural resources and mushrooming swathe of entrepreneurs. India ranked as the third favored destination with 35% of the respondents saying they would invest in India, behind the U.S., which was targeted by 53% of the respondents, and China (38%), according to a report, called Green Power 2011: The KPMG Reneweable Energy M&A Report,” released Wednesday by KPMG that is based on a survey of 500 executives active in the renewable energy arena globally. 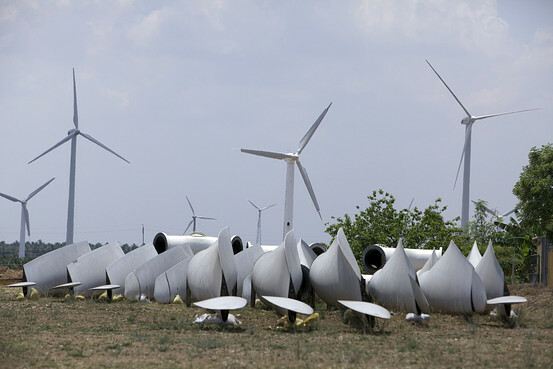 Adeel Halim/Bloomberg News Dismantled windmills lie on the ground at a wind farm in Kammalapatti in India, April 11. For instance, India’s wind-energy companies, which are in the midst of a hectic pace of development, have attracted more than $586 million of project financing this quarter. This already is 63% of the $934 million raised in all of 2010. “The Indian market has become increasingly dynamic in recent years as a result of strong natural resources, greater accommodation to international investment compared with China and a variety of government incentives,” the report said. While Indian banks continue to be the main source of funding, international lenders are taking note. HSBC and Sumitomo Mitsui Banking Corp. provided $110 million debt project financing in March for a wind farm in the western state of Gujarat. The pace of growth and investments in India is part of a worldwide trend. 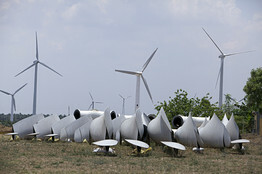 Deal activity among renewable energy companies globally surged 70% in 2010, and continues to maintain this hectic clip in the first quarter, according to the report. In the first quarter, 141 transactions worth $11.2 billion were signed, while last year, an average of 96 deals worth $5.5 billion were announced in each quarter. “All in all, 2011 looks set to be another buoyant year,” the report said, but added a caveat that the first quarter data doesn’t reflect the impact of the tsunami in Japan in March. The survey data also revealed that investors preferred to invest locally rather than across borders. But nearly 60% of Asia-Pacific acquirers said they are targeting India or China. India also features as one of the top three destinations for solar energy companies along with the U.S. and Italy. “With India it is a combination of factors,” said Siobhan Smyth, head of renewables at HSBC, who was interviewed as part of the survey. While India’s solar mission to generate at least 1,100 megawatt of power by 2013 is on track now, private players feel the government needs to accelerate the pace of growth in the coming years to meet the eventual goal of generating 7% of the nation’s power needs. 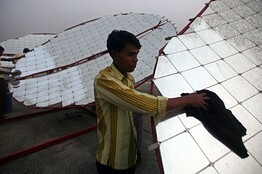 Amit Dave/Reuters Workers clean solar concentrator panels at a solar food processing unit in Gujarat. India’s Ministry of New and Renewable Energy launched the Jawaharlal Nehru National Solar Mission in January 2010 with a stated goal of developing 20,000 megawatt of solar energy in three phases by 2022 and to reach cost parity so that generating solar power costs the same as conventional power by that time. Farooq Abdullah, India’s Minister of State for New and Renewable Energy, said he’s satisfied with the progress so far on its various projects. In the first phase of the mission, the government hopes to build capacity to generate 1,100 MW by 2013. “What is really good about what has happened so far is that it has kick-started an eco-system in the country,” Mr. Kamath said. The federal government’s involvement and active interest in projects has spurred the start of new companies, expansion of existing operations, and addition of labor and new technology. “Our policies in the first phase have facilitated a declining trend in costs and induction of various technology options in the first phase of the Mission,” Minister Mr. Abdullah said. “I am confident that project developers will be able to commission their solar plants well in time and that we will be able to move ahead for a scale expansion in the next phase of the Mission,” he said. Last week, a KPMG report predicted that India’s solar energy sector needs up to $110 billion in capital over the next 10 years to meet its energy goals. However, the last three years the sector has seen only eight investments worth $100 million. Many of the projects are small without a proven track record making it difficult for investors to put their money. It makes it even more risky when India’s banks themselves are hesitant to take on these projects. The KPMG report recommends that the fund, set up with fees levied on imported fossil fuel, be used to promote new solar projects. Also, the KPMG study found that the state electricity boards, which are expected to buy power from renewable energy sources, doesn’t have the financial capacity to do so, and suggests that the government sponsor this as well. India is the fifth largest electricity consumer in the world and the second fastest growing economy. With such a large market, the country’s progression toward renewable energy takes on added significance. According to Bloomberg, a recent report from KPMG suggests this change could happen sooner than many anticipate. Current electricity prices average around 5.42 rupees, roughly 12 cents, per kilowatt hour, less than half the price of solar energy. However, India largely relies on fossil fuels for its energy, primarily coal. The country has long been a net importer, but the gap between domestic production and demand is growing steadily larger. Particularly as demand grows among other developing economies, the price of importing energy looks to rise as well. KPMG suggests that under these conditions solar power could reach grid parity as soon as 2017. The government has announced a goal of installing at least 120,000 megawatts of solar panels by that year, but KPMG thinks the market alone could produce nearly 60,000 megawatts worth of developments within five years of reaching grid parity. While coal provides the vast majority of India’s electricity production, hydroelectricity currently accounts for much of the remainder.